The Cliff House, San Francisco, California (1896-1907). The Cliff House, San Francisco, California, 2008. Old house on the cliff on the left bank of Kura River, Tbilisi, Georgia, c1910. The Kittatinny Hotel, overlooking the Delaware River, Pennsylvania, c1900. House on a cliff on Hierro Island (Canary Islands, Spain). The Mushroom House, designed by Dale Naegle in the 1960s. La Jolla, California. The Holman House by Durbach Block. Dover Heights, Sydney. Town of Manarola, province of La Spezia, Liguria, Italy. Dogon Cliff Houses, Southeastern Mali. Hanging Houses of Cuenca, Spain. House On The Rocks by Fran Silvestre Architects. Ayora, Valencia, Spain. The Leonard J. Malin Residence, aka Chemosphere, Los Angeles, California. Architect: John Lautner. The Stahl House, Los Angeles, California. Architect: Pierre Koenig. The Villa Amanzi by Original Vision Studio. Cape Sol, Phuket, Thailand. The Michael Gantert Residence, the last Pierre Koenig design. Hollywood, California. The Monte Rosa Hut near Zermatt at the foot of Monte Rosa, at an altitude of 2,795 metres, owned by the Swiss Alpine Club, inaugurated in 2009. The Cliff House by Fearon Hay Architects, overlooking Rangitoto island and the Hauraki Gulf near Auckland, New Zealand. The Headland House by Fearon Hay Architects, Waiheke Island, New Zealand. The Sandy Bay Farm House by Fearon Hay Architects, Tututkaka coast. New Zealand. 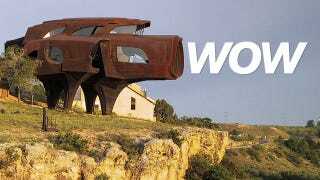 House on the Cliff by Fran Silvestre Architects, Calp, Spain. Cliff House by Altius Architecture. Muskoka Lakes, Ontario, Canada, 2009. Skeleton bay Cottage by Altius Architecture. Ontario, Canada. The Cove 3 by Saota and Antoni Associates. Near Knysna, Western Cape Province, South Africa, 2010. Vame by SAOTA. Yzerfontein, South Africa.